I was bummed to miss my 20 week post last week due to being sick because 20 weeks is technically halfway. BUT “full-term” can actually be anywhere from 38-42 weeks so we’ll call this my halfway mark…especially since it seems first babies are often late. Only time will tell. Baby is growing! Around three-quarters of a pound and 10.5 inches from crown to heel. I’m not digging the endive comparison but some other sites have said large carrot so we’ll roll with carrot. 20 weeks was a banana and I loved that! Although he’s getting all the nutrients he needs from the placenta, baby swallows a little bit of amniotic fluid each day to practice for when he’s out in the real world. The crazy thing is that the taste of the amniotic fluid changes day-to-day depending on what I’ve eaten. And since baby’s taste buds are already starting to develop, he can get some “tastes” of the flavors I’ve been eating. How wild! Since I missed last week, here’s the 20 week “bump”-date. Before I get into the survey-style update on how things are going, let me first take a moment to talk about being sick and 20 weeks pregnant. It has not been a fun ride. I’m currently on day 8 of some sort of upper respiratory infection that has been brutal. Typically, when I get a cold/cough, I feel bad for 2-3 days and then it’s just nagging symptoms but nothing that I can’t manage. This time around, not so much. I have had eight straight days of feeling tired, achy, congested and coughing like crazy. My symptoms first started on Monday, December 18. I felt tired and like I had a little tickle in my throat. I knew it was going to go one of two ways and unfortunately, it went the way of sick. Overnight on Monday everything set in and I coughed all night. Tanner held me and I just laid in bed crying because I felt so awful. Every day since then has just been more coughing and increasing head/nasal congestion as the days go on. I’m also really hoarse. Each day I think, “okay, this is it…I’m turning the corner” and then I just don’t feel better. The nights are the absolute worst. I’m sick and want to rest/sleep but the congestion and coughing are terrible at night, even when I prop myself up. Apple cider vinegar shots, 1-2 tablespoons 2x day. Running a humidifier at night. Diffusing peppermint oil and lavender at night. Tons of fluids like water, hot tea, ginger ale and apple cider vinegar drinks. Neti pot. This is definitely my favorite natural remedy so far and I can’t believe I waited so long to try one. I called my doctor’s nurse on Saturday and she told me some OTC things that I could take and told me if I wasn’t feeling better on Christmas Eve to go in to OBGYN urgent care. Well, I felt bad on Christmas Eve and made an appointment to go in and when I arrived I was told that the OBGYN wasn’t there but I could wait a couple of hours to see the regular doctor if I’d like. Give me a pass on being pregnant and hormonal but I left and then called Tanner from the car crying. I ended up speaking on the phone with a friend of ours who is an ER doctor and she said she thought I was okay just to keep riding it out since I wasn’t running a fever and didn’t feel flu-like. She encouraged me to take some of the OTC meds so here’s what I’ve taken. Benadryl at night to help me sleep. Tylenol (regular strength) to help with body aches a couple of times. MucinexD half doses, one on Christmas Eve and one on Christmas Day. My doctor’s office suggested this. I have only taken half doses because a) anything with Sudafed in it makes me feel legit crazy and b) I wanted to be as cautious as possible with the baby on board. While I don’t feel well, my biggest concern has been for baby boy, especially with all the coughing I’ve been doing. I’ve been assured that he is very protected in there – both from the sickness and from the coughing – but it’s still hard not to worry. I wish I could say that any of these things were magic fixes but to be honest, nothing has really helped a ton and only time will get me to the other side of this. There is a ton of respiratory stuff going around in Charlotte right now. I do see my OBGYN on Thursday for my monthly check-up so I’m looking forward to hearing baby’s heartbeat on that doppler and talking with my doctor about all of this. How about another bump shot? It looks so much more “real” when I’m not standing straight to get the weekly documenting photo. Weight Gain/Body Changes: I think I’m around 11-12 pounds gained at this point. Nothing crazy with body changes other than filling out in the chest, abdomen and hip/booty area. Workouts/Workout Modifications: ahhhh, baby FINALLY moved up off my bladder and running was starting to get comfortable and then I got sick and haven’t run in a week and a half. I’ve been taking it easy on workouts the last couple of weeks, a couple yoga practices, some walking and some strength before I started feeling really bad. Symptoms: nothing to report on the pregnancy front other than this URI. Food Cravings: still wanting lots of carbs and pineapple, which has been pretty constant through pregnancy for me. Sleep: has been terrible due to being sick, not due to pregnancy. Maternity Clothes: still haven’t bought anything maternity specific but I did go to Lululemon and got some things a size up as well as some roomier-cut tanks. 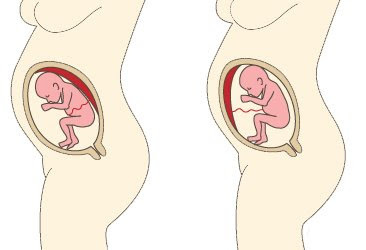 Like the one on the right so my placenta essentially acts a cushion between baby and my stomach which means I don’t feel as much movement. I’ve finally started feeling some rolling and kicks, especially at night when I get in bed and am very still. It’s on and off at this point and I’ll go a day or two between feeling him so I’m ready for a little more consistency for my own peace of mind! Next up: oh man, we told ourselves that we would get through the holidays and wait until the new year to start on things like nursery, planning showers, signing up for classes, etc. and that time is fast approaching. I can’t believe that we’re just a little over four months out from meeting baby boy! Have you experienced being sick while pregnant? If so, how did you deal? With both the actual sickness and worrying about baby? Does anyone have experience with hiring a doula? This is something I’m considering strongly for birth. I hope you feel better soon! I too had a bad cold/cough in the second trimester. It’s the worst! I think I took Benadryl and made sure to drink a ton of water to make up for the drying nature of it. Yes! I’ve been drinking so much liquid, it’s crazy! First I hope you feel better soon!! Second: can’t believe you are at 21 weeks! And looking incredible 🙂 So fun to learn about everything you are going through as you grow a little boy. Early May will be here so fast!! Thanks Nicki! Me too! And I know, 21 weeks!!! It’s hard to believe there is less in front of me than behind me now! Thank you for the comment and I just wanted to say that I’m sorry that you are struggling. I know what an emotional rollercoaster TTC is and I hope you’re getting lots of support both on the medical and emotional front. Please stay hopeful. <3 I am sending you love, strength and prayers that the outcome will be different very soon. I have a great idea for congestion for you! You know those Breathe Right nasal strips used to help snoring?? I now use them when I’m congested at night to keep the nasal passages open, and they are AMAZING. I was actually so sad I spent so much of my life congested without knowing of this trick – haha! Give it a try… and hope you feel better!! Ha! LOVE this suggestion! Would have never thought about this! I *think* that I’m finally turning a corner but I see my doctor tomorrow and will make sure to get a thorough check from him. Totally down with the antibiotics if they are necessary but I also knew that the common cold lasts 7-10 days so I was trying to wait it out to see if it started clearing on its own. Gah, definitely ready to bid farewell to this thing either way! I was fortunate to only have a couple of URI and 1 gi bug during pregnancy, and i found reassurance in feeling movement (and also doing almost daily ultrasounds…a perk of my job!) I have done some unofficial doula work for friends and acquaintances, but did not have one myself. I think I did fine without one during the labor and delivery (being a LD nurse for 9 years, teaching childbirth and lactation classes, and currently in midwifery school, I knew what to expect), but I think I could have really benefited from one during the postpartum period. I’m sure Charlotte has tons of amazing options! I have to say I’m a little jealous of your ultrasound availability! 😉 That’s awesome! It’s also really cool that you have so much experience in L&D and are in midwifery school. I think the shift towards midwifery is amazing and really needed when it comes to women’s health, pregnancy and childbirth. When it comes to doulas in Charlotte, we are VERY blessed with abundant options for birth doulas as well as postpartum doulas. I also love the shift towards postpartum doula care and I think it’s a wonderful resource for new moms. I know quite a few friends who have greatly benefited from it. If you ever find yourself in boring, small town ruralville Eastern NC I’d be thrilled to share my perks! While I’m sorry to see you go, I won’t apologize for the pregnancy/baby content. This is a blog about my life and right now being pregnant and preparing to welcome a baby into this world is a pretty significant life event. I’ve actually found an outpouring of support, love and connection from sharing about my pregnancy on my blog. That said, in my 19 week update post I clearly stated that I 100% understand and have no hard feelings if anyone feels like the pregnancy content isn’t for them regardless of the reason behind it. I understand completely that you don’t want to read it and aren’t interested but I wish you didn’t have to say it in such a hurtful way. I appreciate the time you did read and wish you well. I don’t ever comment, but just felt an inner nudge to do so after reading Sarah’s completely unnecessary comment. I love your blog and have been reading for quite a while now. I enjoy reading your baby updates and look forward to them every week! Most of us DO care about your precious baby 🙂 I hope you kick this URI soon and start feeling better! Long time lurker and I have a 6 month old. I had a cold around the 20 week mark of my pregnancy and I found it helpful to drink hot water with lemon, cayenne pepper, and honey along with diffusing eucalyptus. Plus lots of baths to help with the aches, just don’t heat the water too hot. I used a doula and even with my crazy emergency c-section found having her present to be so helpful with calming my nerves and my husband’s. My doula was Friday Pettit and she is in the Charlotte area. Baby + Co Charlotte also often hosts doula meet and greets, and you don’t have to be a patient to attend. Hi Rachel – I’m sorry you also dealt with sickness around this point of pregnancy. Thank you for the drink recommendation. That sounds very warming and comforting. I appreciate the doula recommendation and I had no idea that Baby + Co did that! With my first pregnancy, I had a pretty bad cold. I took vitamin C, zinc, Emergen-C in my water, and turmeric in ginger tea. I also rested a ton, didn’t exercise or do anything other than go to work. Tour the last month of my second pregnancy, I was hit with a terrible violent stomach virus causing me to go on maternity leave three weeks early. It was scary but baby was indeed well protected and I tried to stay hydrated as much as I could adding in electrolytes. Are you kidding me?! That is so incredibly rude to say. This is JEN’S BLOG, aka she can talk about whatever she wants!! I hope in the future you realize that saying nothing is better than saying anything if it’s hurtful. AHHHHH to you due date tomorrow! I am so excited for you! Sending you lots of love as you prepare for delivery and welcoming your baby into the world! Sickness: I had the flu while 4 months pregnant with my second. I was running a fever so the ob has me take Tylenol but I was worried to death about harming her. It took me one whole week to get out of bed and two weeks to feel better. Doc assured me that baby was going to be fine, but I still worried. Doula: I had one with my first and she was fabulous!!! At first hubby wasn’t sure we needed one, but looking back, he was SO glad we did. Laura Speece at Natural Abunance. She’s based out of Charlotte. Give her a shout. Oh Audrey – the flu while pregnant just sounds terrible. I am so sorry you had to deal with that. I’ve only had it once in my life and that was enough for me! Thank you so much for the doula recommendation. I will reach out to her! Thank you so much for the well wishes Joy! That’s exciting that you have started to feel movement! It took me until around 21-22 weeks to feel movement (I have an anterior placenta, too) so it’s great that you felt it a bit earlier! It seems like I’m feeling the movement more and more with every day that passes. He was super active last night when I got in bed and I’ve felt him this morning sitting at my desk too! First comment since the announcement and I am so happy for you and love reading your pregnancy posts, even if my baby growing days are over! Ignore the haters…I’ve been following you for years and I love the mix of every day life, your personal shares, and fitness and health related content. You balance it all very well and is the reason I’ve stuck around this long. I’ve been sick numerous times in pregnancy and I agree with an above commenter in that you have to take care of yourself! Take the OTC stuff you need to while balancing with holistic options and hopefully you’ll see yourself on the other side soon. As for a doula, I used one with both my 2nd and 3rd pregnancies and highly, HIGHLY recommend it. That said, I did have a homebirth with both of those pregnancies, so it felt pretty imperative to me. 😉 But it was so great to essentially have a labor “coach” who could hep and support me and take a little pressure off my hubs. That said, we had another child at home so he was occupied with him quite a bit, but she helped me in so many ways. I’d happily answer any questions per email if you like. Get well soon!!! I almost never comment on blogs but I had to jump in to say that I most definitely recommend having a doula! I had my first baby in September and I knew I wanted one – my husband wasn’t sure until I showed him the stats demonstrating that women with doulas have fewer interventions and way fewer unplanned c-sections. I can’t remember the number off the top of my head but I want to say it’s something like a 40% reduction in c-sections! We don’t live in your area but I used doulamatch.net to find ours. We met with four doulas before hiring one. I picked her based on a gut feeling and loved my doula SO much. Leading up to the birth, it helped with my anxiety to have her help with my birth plan and answer any questions I had come up; and she was such a supportive and calming presence during my actual labor. My birth was pretty “easy”, but there were a few tough parts and she helped me stick to my birth plan when I was freaking out. My husband also found it incredibly helpful to have her there to provide guidance on things he could do to support me. I still can’t believe how much she did for the price we paid – it was worth every penny. Hey Kaitlin – thank you so much for taking a moment to share your positive doula experience. The benefits you outlined are exactly what we’re looking for – reduced intervention, avoiding c-section if possible and labor support and coaching for both Tanner and myself. Also, I’d love to have her as a pre and post birth resource. I will check out the website that you mentioned and I definitely plan on meeting with a few before making our choice. I’m glad to hear that you did that too! I hope that you are feeling better! I love following along with your pregnancy 🙂 Being sick while pregnant is awful! I’m not sure if this is allowed during pregnancy but one time I legit injured myself and developed costochondritis from coughing so hard and so much- I mixed breathe essential oil (doterra brand, I’m sure there are comparable blends from other brands) with coconut oil on my chest and it helped my coughing so much-it was a miracle worker for me! I think I took airborne a few times while preg even though you aren’t supposed to. I would honestly continue to rest as much as possible. The immune system is more susceptible during pregnancy so it’s common to get sick. I had a doula and it was a so-so experience which is too long to detail here. I would just suggest interviewing several before making a decision. One of the issues I had was the doula does not check your progress… so I’m not sure if she was clueless on how far along I was or not… but I basically got to the hospital super late because she kept telling me to stay home. Then things kind of escalated from there. Oh, how I feel for you. I had something similar for a few weeks in the last month of my pregnancy. I thought I was going to cough the baby out! Delsym Cough helped me sleep at night. It’s dextromethorphan without a bunch of other additives. I hope you’re feeling better soon! I’ve commented this before on your weekly updates, but I love going back and reading them a second time now that I’m pregnant. I had a cold/respiratory thing too during my 18th week (I’m 21 weeks now) and it lasted around 10 days. It’s so rare that I get a cold and this one was especially a pain since the meds you’re allowed to take are so limiting. I’ve only gained about 6lbs so far! I can’t believe you were at 11-12 lbs at this point because you look so small! To outsiders I must just look like I had a burrito for dinner. I too am at the point where I’d like to begin looking for a doula!